My middle son, Ryan is a 2nd Lieutenant in the US Army. He’s a tank platoon leader stationed at Fort Carson, Colorado. One day during his initial tank training in Fort Benning, Georgia, Ryan was instructed to report to the firing range for grenade training. The instructor, tasked with teaching the young officers in Ryan’s class the fine art of grenade throwing, was a salty First Sergeant from Macon, Georgia named Jedediah Jones. handgrip, and arm the grenade while behind cover. Assume a natural stance with the weight balanced equally on both feet. In high school, Ryan was a low to mid 80s righty. He went on to play a season of JUCO ball before answering the call to serve. Ryan didn’t have elite velocity, but he was a bulldog competitor and his command was laser-like. During the fall of his freshman year in JUCO, Ryan pitched 30 innings without walking a single batter – in fact, he only had one 3 ball count the entire time. After watching several of his classmates struggle with the recommended technique, it was Ryan’s turn. He had seen enough. Ryan popped to his feet, knees slightly bent. Holding the grenade by his chest, he spotted target number six and pulled the pin. Without hesitation or thought, he whipped the dummy grenade at the target. He smiled and pumped his fist as the M67 smashed dead center into the bullseye. The class of about 25 officers cheered and moved closer. To their collective glee and amazement, Ryan proceeded to nail not 6, not 10, but 20 targets in a row! When the final target was dotted, the soldiers erupted in an unbridled celebration. First Sergeant Jones turned remainder of the session over to Ryan, asking him to teach “Ranch Style” grenade throwing to the rest of the class. According to warhistoryonline.com the origins of the grenade warfare dates as far back as the 15th century. Due to inadequate controls and a rash of accidental detonations, use of the grenade went dormant until it was revived in the trenches of WWI. Allied hand grenades, resembling an oval-shaped baseball and German stick grenades known as “potato mashers” were frequently lobbed into enemy trenches with lethal effectiveness. For several years, the baseball training industry has unknowingly and indirectly benefitted from the evolution of grenade design. In 2014, our friends at The Texas Baseball Ranch® introduced the baseball world to a 2 kg weighted bell club as an accessory for enhancing arm path and functionally strengthening posterior shoulder musculature. Austin Wasserman of Wasserman Strength has presented what he calls “The Water Bottle Drill,” as a means for developing smooth and natural arm action. In 2016, when I wrote Start With The Pain: The Complete Guide to Managing Arm Pain In The Elite Throwing Athlete, I recommended 1-pound Indian club as a throwing tool to eliminate arm pain by improving arm action efficiency. Even though the Indian club was highly effective, it wasn’t an optimal solution. The knob on the end of this off-the-shelf item created an irritating friction point on the medial palm that sometimes slightly altered the athlete’s throwing pattern at release. Noting the relative success of the Indian club, but also recognizing its limitations, Coach Ron Wolforth asked Robert Oates of oatespecialties.com to design a slightly larger throwing club to help with movement pattern development and arm pain management. After months of research and trial and error prototyping, The Tap Connector™ Throwing Club was born. According to Mr. Oates, you can trace the shape of The Tap Connector™ Throwing Club all the way back to the Australian Aboriginal hunting stick. The design was advanced coopted by the German army World War I and II stick grenade. Meanwhile Americans were developing the M67 grenade used today by the US military. Some estimate the German stick grenade had an effective range of about 60-100 feet – about a third farther than the American hand grenade that was shaped to feel like a baseball. At The Florida Baseball Ranch® we began using the Connector Club in July of 2018 and immediately, our players gave it rave reviews. Initially, we deployed the Club as a part of our Level 3 pain intervention. Two pitchers, who had been struggling with anterior and posterior shoulder pain respectively, found instantaneous relief when they threw the Connector Club. We designed corrective throwing drill protocols to eliminate all contributing biomechanical inefficiencies. In the first week of the protocol, our athletes threw only Connector Clubs (no baseballs) during their drill work, but over the course of about 30 days, we gradually reduced the number of throws made with the Club and replaced them with baseball throws. When the plan was complete, both players’ arm action and deceleration patterns had improved significantly and both were completely pain-free. For more on our innovative arm pain management system, check out Start With The Pain. In late August, one of our local Ranch Guys, a 5’4” 16 year old who came to his initial evaluation with self-reported anterior shoulder pain and maximum velocity of 84 mph, was struggling to eliminate the most severe inverted W disconnection in my recollection. Despite diligent commitment to his corrective throwing drills, after nearly 3 weeks his movement pattern hadn’t changed much. Our Director of Player Development, Corey Stump, shot this video which clearly illuminated the problem. Corey suggested trying a Connector Club to encourage a more natural and efficient arm path. The results were certainly encouraging. We have rewritten his throwing protocol to include a healthy dose of Connector Club throws. We’ll keep you updated on his progress. It makes sense that the Connector Club, which looks and feels a lot like a German stick grenade would encourage awareness of an efficient, less stressful throwing motion. In the early 20th century, when US and German military engineers designed the grenades that are still in use today, they faced distinctly different challenges. In the US, baseball had become our national pastime and nearly every soldier had been exposed to the game in some form. US military engineers rightfully decided to make a grenade that resembled the size and shape of a baseball. On the other hand, in Germany, where soccer was (and still is) the sport of choice, soldiers with practically no throwing experience needed an ergonomically sound device to optimize efficiency. The Tap Connector™ Throwing Club encourages a more efficient arm path that reduces soft tissue stress. The Tap Connector™ Throwing Club is an intriguing tool that is rapidly becoming an important piece of the Florida Baseball Ranch® training process. If you’d like to learn more about our innovative approach to training and rehabilitating throwing athletes, why not register for one of our remaining Elite Performers Boot Camps? We have camps 3 left in the 2018 season. Get here and let us design and teach you a 360 degree tailor-made training program that will turbo boost your baseball career. This past summer over 125 Ranch Guys trained hard and gained an average of 4.2-6.1 mph in velocity. The same guys improved their strike-throwing ability by an average of 16.6%. over 8 weeks. Additionally, 100% of the athletes who entered summer training with self-reported arm pain of 4/10 or higher were completely pain-free after 4 weeks. We will be replicating this incredibly successful program this winter. 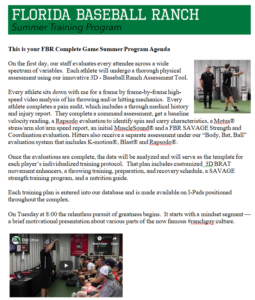 It’s called the FBR Complete Game Winter Training Program and it runs from December 17th, 2018 through January 18th, 2019.